The first strange finding, however, was seeing one of my colleagues’ profile listed under this firm… Marta surely works for Randstad so I checked this company in Google and realized these words were not referring to any company but simply to the word ‘optician’. Certainly, Marta is not an optician and it is even more certain that there are no 12K Polish optician users on LinkedIn today. What is going on?? 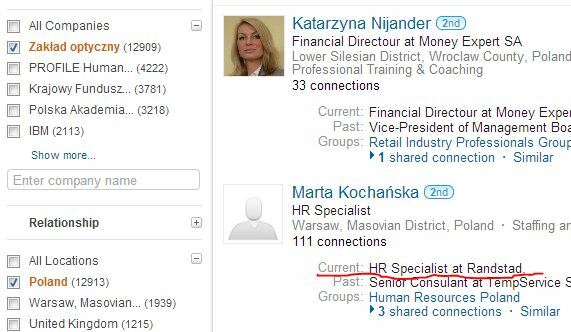 If you go to Marta’s profile you see that she added a comma after Randstad so that LinkedIn was not able to properly recognize the company. If you check the profile of this company you see that it indicates a size of 201-500 employees and actually, the profile is a quite nicely completed one. If you check, however, the links added to the company profile it immediately gives you the impression that something smells pretty bad. 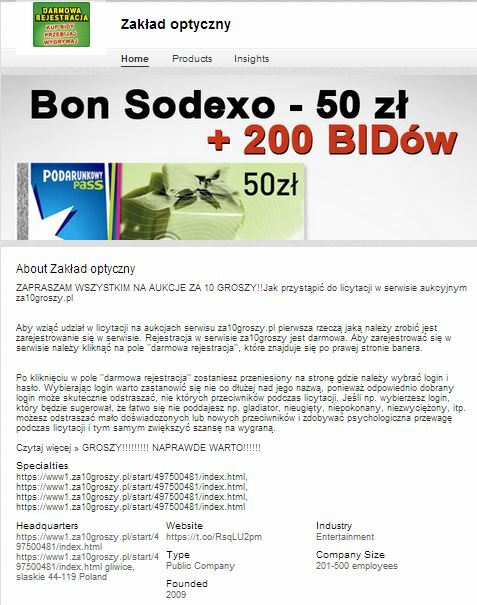 This company profile is fake, the URLs are probably harmful for your PC and it is, of course, just not true that it employs 12 K people in Poland. Go and play around with your country: you will see very similar No.1 fake company profiles!… Most of them are not existing and their URL is not leading to anywhere. I can understand that as fake ‘human’ profiles exist fake company profiles can exist, too, but… why do LinkedIn seem to automatically add/link these company profiles when a user is missing to use a proper one? Is there anyone at LinkedIn who is checking or filtering these companies and removing the ones which seem to be scams? Well, I am not much scared (hey, I am a sourcer!) and actually found a Hungarian example being extremely funny but still… LinkedIn – hope you will hear me and see the potential risk in it?